My handmade lucet, and some cord I made today. Lucet is a yarn or string technique, whereby a piece of yarn or string can be made into a stronger or more effective cord or thread. The process uses a tool called a lucet, which resembles a two-pronged fork of wood, with an extra hole in the belly of the fork. 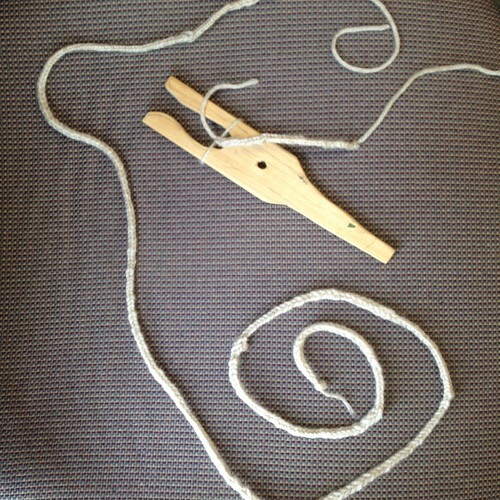 I happened across a simple video today of how to lucet, and immediately recognized that this could be part of my string class, where kids spend a day a week for seven weeks coming to the Design Lab to play with string, yarn, wool, and other materials, to learn how to work with string in a variety of ways — to make knots, to knit, to weave, to dye…. and apparently, now, to lucet as well. The cord that’s produced is strong and flexible, with much less ‘give’ than the original yarn. It’s got a beautiful herringbone texture to it, which my camera is not good enough to show. There are of course applications for the Design Lab, which is my school’s Makerspace. With metallic yarn, for example, this technique could turn out braid for our costume shop, to make braided elements for costume uniforms. This technique can also be used to create decorative trim for bags and pencil cases. It’s also a great tool for teaching about the Vikings, since this is apparently one of the ways that those intrepid sailors of the northlands used to make cord, line and rope. It’s also a tool that a kid can make themselves from a basic example, so it’s a great way of teaching some simple carpentry skills. It’s also a tool that an older child can make as a gift for a younger child — the older child learns some carpentry, and the younger child learns cord-making; and both benefit because the resulting cords make great friendship bracelets (and the whole thing is much, much less expensive than those awful rubber-bracelet kits that were so popular a year ago, and now have vanished like snow under April rains). I used lath wood left over from another project to make my lucet; it’s not quite the right shape but it works plenty well. Most of all, I think that string is one of those things that we take for granted in schools. A few years ago (and every few years since) I’ve tried to teach the three or four basic knots to my classes which in theory every Boy Scout should know. And I failed. School culture (both here, and at my old school, and at another school) was simply not set up to teach the basics of knots to students. It wasn’t part of the culture to work with something as elemental and basic as string. Can you believe that? And yet, it’s apparently at the heart of our rise to power as the allegedly-dominant species on the planet with our intellect and skill at toolmaking. What is not shown, must be valuable. It’s part of the reason that string technology — weaving, knitting, sewing, textile arts in general — has played and will continue to play such an important role in the design lab at the school where I teach. In researching this topic a bit today (with our school nurse, as it happens, because I showed her this technique, and she was amazed, and immediately went to Pinterest in search of additional information), we learned that this tech was used in the 1200s and 1300s to make strong cords to attach sleeves to jackets called gambesons and hold up pants and hose. It was good for attaching armor to under layers, in part because it’s such strong cord, and can’t be cut easily; so it strengthens those parts of the armor that are at risk of getting damaged. In other words, its a way of strengthening the weakest links (sometimes literally). It can be bent or curved and sewn down into place to add decorative elements to plain panels of fabric. Which means that it can be used as a way of dressing up or accentuating an existing piece of clothing, to make it more uniquely your own. Which is awesome. I’m always slightly reluctant to talk about how the things that I make for school fit in with magic; but of course magic relies on materia as much as anything other sort of art. With a bag (like the one I made yesterday) on my belt as a place to hold the ball of yarn, I could walk through the woods or around my town, with lucet in hand as I go. The spell or the intention that I hold would then get woven into the cord, which could then be applied to other purposes. The quality of the lucet, and of the yarn, of course, would matter. But if I got my yarn from Deb, for example, through her store, or if I made it myself, or got it from Webs, those choices would all have an effect on the magical nature of the working. The thing that I like about this, of course, is that the technique of braiding using this tool is Scandinavian in origin, but the tech has gone in and out of fashion at various times in the last thousand years. It doesn’t belong to any one nation or tribe, either, and it’s done everything from make rigging cord for ships to decoration for uniforms. It’s part of the cording lore, and the knot lore, part of the way that human beings work with string to make it do our bidding. And that means that it can hold our intentions, too, whether it be for the purpose of holding an opponent strongly, or making an effective tool for wrapping and holding, or linking together our thoughts and purposes. A distinctly ancient technology, with a potentially useful magical twist. The String Page, with additional links to naalbinding and other techniques. The video referenced above, embedded. Thanks for teaching me a new skill. I’ll be passing it on to others as rapidly as I know how. Guys this is such a great thing, how did I never hear of it until now? I want a lucet!